A new plan for QVM infrastructure and car parking is to be put to Council for decision next Tuesday. This plan follows the rejection of an initial proposal involving underground facilities at ABCD sheds. A 40 member People's Panel recently made recommendations on market infrastructure and car parking. - $6 million will be invested to create cool and dry storage at fruit and vegetable trader’s stalls. There will be extensive consultation with traders to get the designs right and consultation with Heritage Victoria. - A $19 million investment to provide up to 500 customer car parks on a future Southern Development Site on Franklin Street. - Another 500 customer car parks already being delivered as part of the Munro development in 2021. 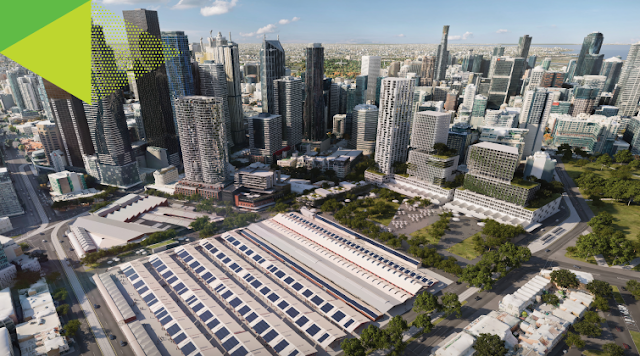 - The existing asphalt carpark will become a 1.5 hectare public open space called Market Square, larger than Fed Square. - Further design and costings to consider storage and waste facilities in Queen Street with new “Operations Hubs”. An accompanying video shows one hub to be located at the Southern end of Queen St., one at the Northern end, and one at G Shed. The hub at the Southern end is designated as “Queen’s Corner”. - On-site restoration of current sheds. - Therry St., Queen St., and the current car park designated as public spaces. The Missing Piece Of The Trader Storage Survey.